Place the chicken in a large pot, add enough water to cover the chicken, and bring to a brief low boil. Reduce the heat and simmer for 15 minutes, skimming off the foam and odd bits of things that float with a big spoon. Discard all the foam. After 15 minutes have passed or after the foaming subsides, replenish any evaporated water, bring back to a simmer, and check to see if there is more foam to skim. If so, do it. Place the onion skin, parsley, cloves, peppercorns, and bay leaves in cheesecloth. Tie off and add to the stock. Cover with vented lid and cook on low for 1 hour. Remove the cheesecloth with its contents and discard. Remove the chicken to a platter or dish with sides to catch the liquid. Let it sit and cool until it is easier to handle. Use a slotted spoon to remove the bits of bone and skin from the pot. Or strain stock through a fine mesh strainer and return the clear stock to the pot. Straining is the easiest and fastest way to do this. Place your receiving bowl in the sink with the strainer sitting on top to avoid making a mess. Add the carrots, celery, and onion. Sprinkle in thyme and the pinch of ground cloves if you did not have whole cloves. Add salt to taste. Start with just a teaspoon. You can always add more when adjusting the flavor after it simmers a little more. When the chicken is cool enough to handle, separate the meat from the bones and skin. Shred or chop meat into bite sized pieces and return to the soup. Cover with the lid tilted to vent and simmer on low for 1 hour. Do not let the water boil. Taste the stock and adjust the flavors. If it reduced too much you may add water, but remember this will thin the flavors, so season accordingly. Allow a good 3 hours to include the prep and skimming. This soup can easily sit longer over a very low heat, so if you want it to go 4 hours or more, that’s fine. When reheating from leftover you may notice that the stock is almost gelatin like. That’s great! Means you did a good patient job of making the stock. Let the leftovers come to heat slowly and wait before adding any water. You might not need any at all. 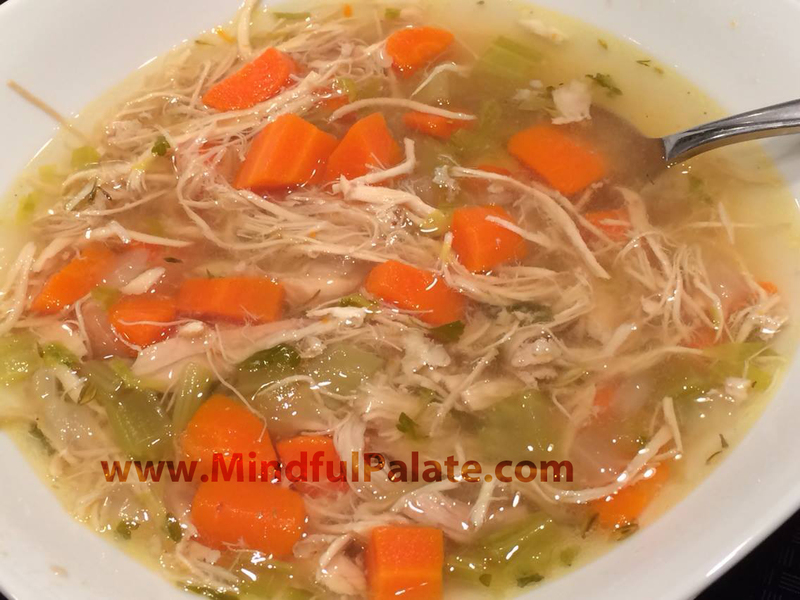 This entry was posted in Chicken, Main Dish, Soup and tagged chicken soup, homestyle. Bookmark the permalink.